Stock Cars Stock cars have come a long way since the days of the old jalopy but many race fans will tell you the vintage stock cars put on some of the best fender banging action of all-time. I started my brief but distinguished career (ahem) racing with the CARC at Second Creek Raceway in 1998 running our Toyota Corolla (lovingly nicknamed "Crayola". Most of the thanks for this goes to Scott Rhoades, who was one of my auto mechanics students at the time, and John Witthar, who built our roll cage at a discount. We used the car as a class project. Here are Scott and I at the parking lot of the Career Enrichment Park in Westminster before the season started. Scott was driving Frank Young's #2 Dodge Omni 024. Here's our Joe Starr photo of our team in 1998 at Second Creek with Crayola. From left to right: Johnnie Lor, Scott Pasionek, Derek Vincent, "Sadie", Tisha Bedwell, David Zaner, Aaron Crooks, Brendan Pettid, and Nick Johnson. I'm the one kneeling in the driver's suit. What a great time I had racing at that little track! The sad ending for Crayola. It was the final week of the 1998 season and I had T-boned Suzie Bricker's Capri the week before. I learned several things from this incident: first, my welding abilities needed a little more work. Second, those tire walls are a lot harder than they look! Third, once you're on the grass, brakes don't do you no good with slicks! Fourth, John Witthar builds a good roll cage! Fifth, "horse collar" neck supports can give you a sore throat. Upper front bumper nerf to protect the radiator is probably still out there about 50 feet from the point of impact! Thanks for posting that picture of Charlie, Este1. Those guys at Sparks Blacksmith helped me build my car. Charlie was the guy to beat for sure. I was the blue 27 with a midget hood and an Edmunds tail section. area running the Second Creek Raceway in 1996. That #20 car was driven by Wiley Timbrooke. 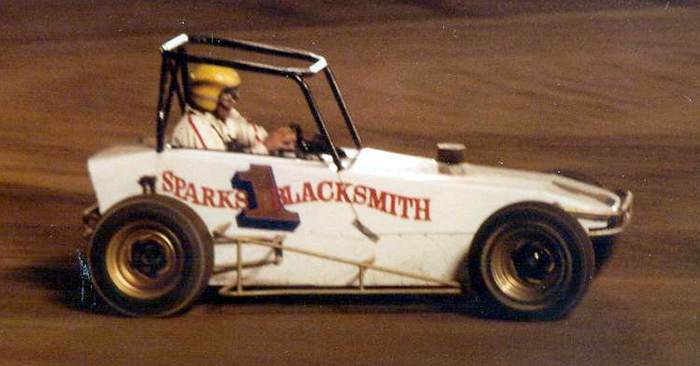 Just another of the many mini stocks he had driven over the years at both Englewood and at Lakeside Speedway. I personally took this pic when Rich Codner and the track photographer allowed by down in the infield on this particular day. sparks blacksmith built my dads opel too. 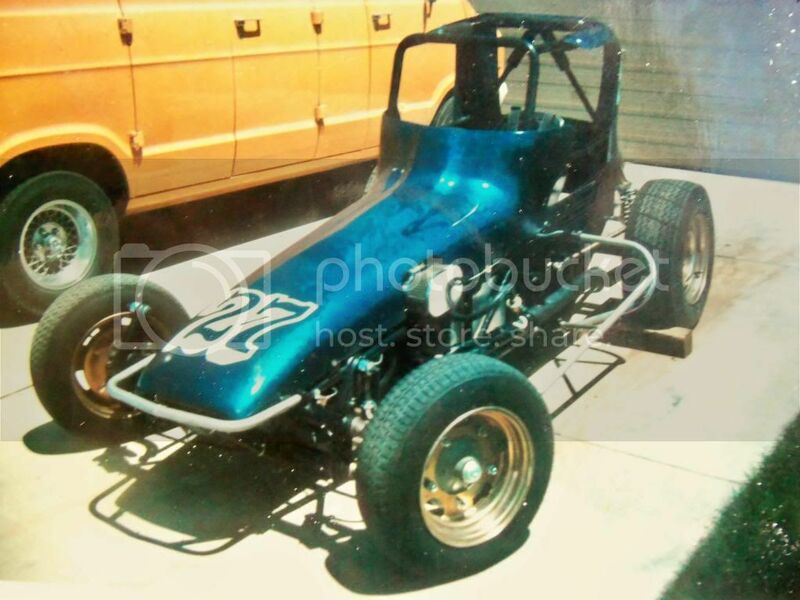 I was cleaning up some stuff, last week, and found a picture of my FASCAR mini modified from 1980 that I raced at the Reno fairgrounds. The rules were any 1,200 cc motor Datsun or Toyota, VW front end, 79" wheel base min. and the motor set back was 27" from the center of the front axle to the first spark plug. Fun stuff, which there was something like that again.